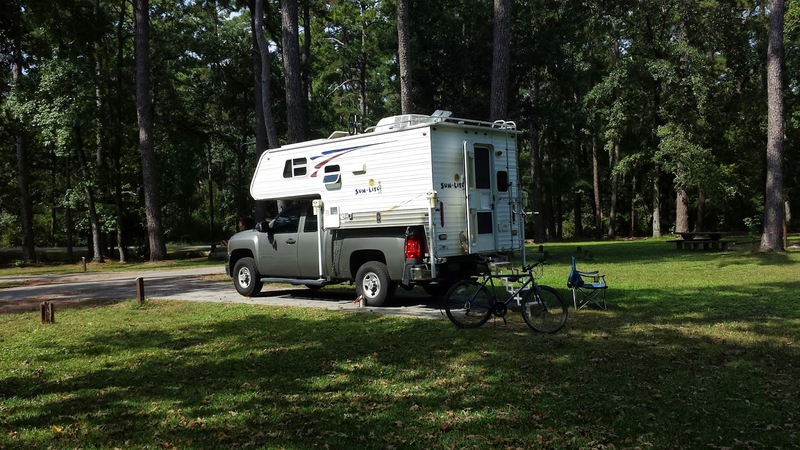 I spent a couple nights at the Escapee's campground in Livingston in order to pick my 2015 Texas state sticker for my truck up (The Escapee's are my mail-forwarder and they do a great job if you need one.) Not too far to the west of Livingston is the Sam Houston National Forest, one of four National Forests in Texas which seems low given the immense size of the state, but that's all there are...just four. 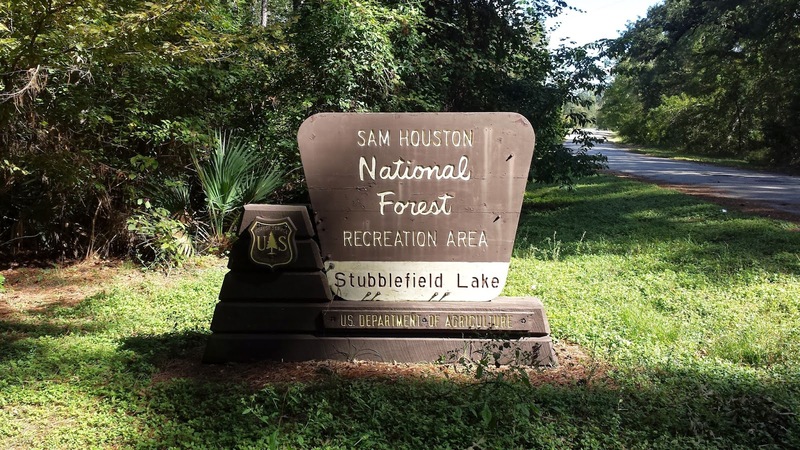 There are several camping areas set up by the Forest Service within the Sam Houston and I went for the Stubblefield Lake Recreation Area which if just northwest of Lake Conroe. 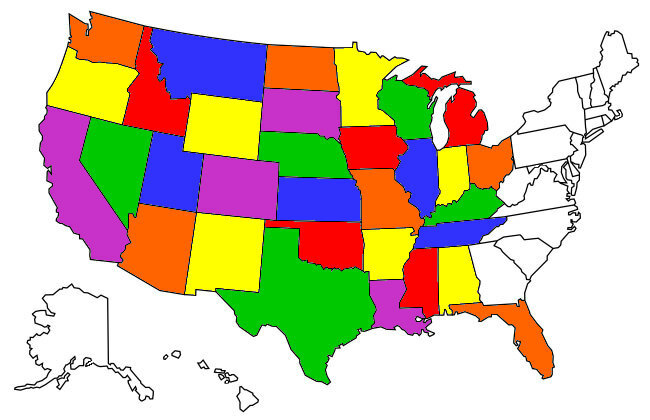 New Waverly, TX is the closest town. The Recreation Area was built in 1937 as part of the New Deal and consists of 30 RV parking sites (no hookups) and probably double that tent sites dispersed around a loop with two restrooms with flush toilets and showers at opposite ends of the Area. Really spacious campsites under tall trees. 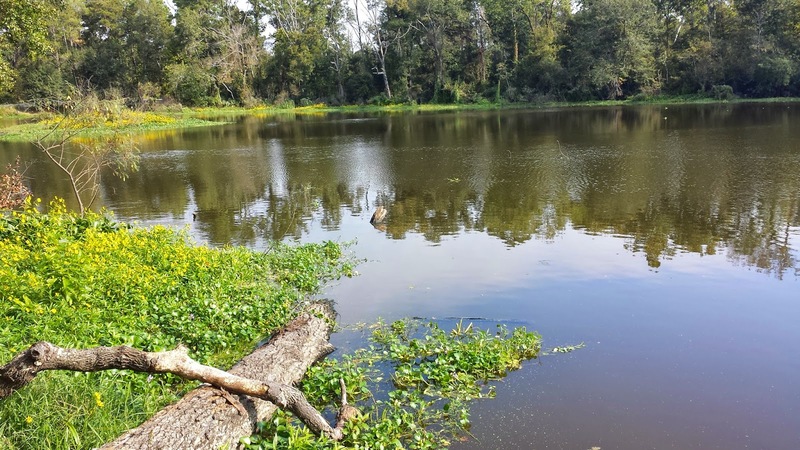 Stubblefield Lake is more pond-like than lake-like. There is a covered pavilion at the Rec Area with picnic tables for group picnics but since you can't reserve a campsite there I'm not certain how one would reserve the pavilion. The campsites are given out on a first-come basis and bring exact change because you pay by putting cash into a Forest Service envelope at the entrance gate and then into a metal mailbox-style envelope container. There is a nice couple who act as park hosts and from the look of their campsite they've been at it for a long time. They come by and greet each party of campers and check to make sure you've displayed an envelope sticker on your dash that proves you've paid. The lady explained that a tow service promptly removes vehicles without proof of payment, and I saw him drive through the loop a few times, FYI. 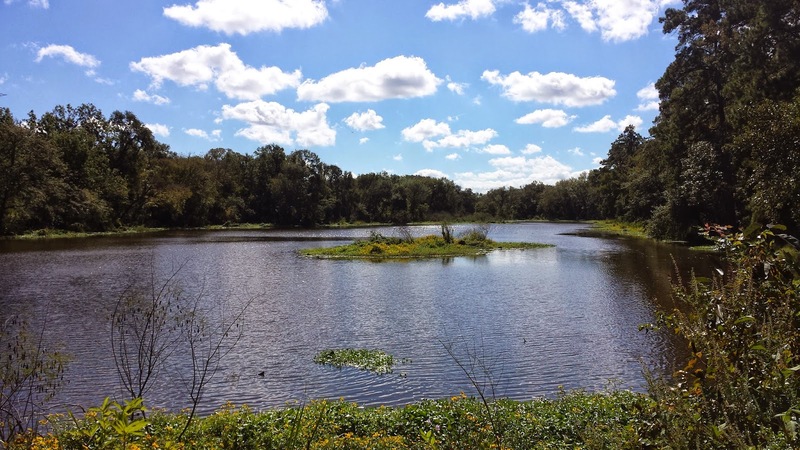 A small island in the middle of Stubblefield Lake. One of the things that first attracted me to Stubblefield Lake was all the online reviews mentioning that the nightly cost was $10. No longer, somehow the Forest Service deemed a 50% rate increase to be reasonable and $15 per day is now the cost which I found a LITTLE steep for primitive (no hookups) camping without a dump station. Spanish moss hanging from trees along the lake shore. Only an hour north of Houston, Stubblefield Rec Area fills up almost every weekend so I wouldn't advise knocking off work at 5, driving home then heading up on a Friday night although there is an overflow area just to the east of the Rec Area that looked like you could stay in for free - without rest rooms or trash service though. My stay at the Area was quiet and relaxing and the October weather was perfect. 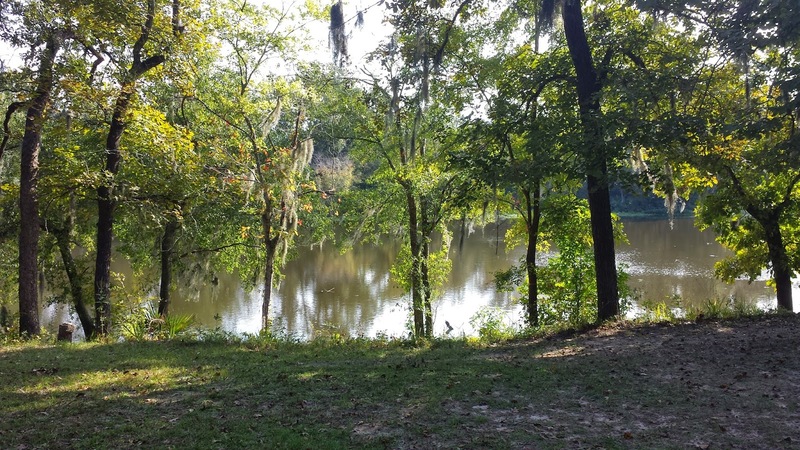 If you can overlook premium primitive camping rates you'll enjoy Stubblefield.